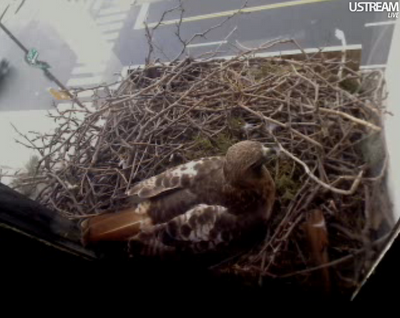 Hat tip to Silverbug Studio for pointing out this excellent Red-tailed hawk nest cam. The nest is in Philadelphia, PA on the Franklin Institute building. The camera is very high quality and it is a live streaming video. You can see the bird move around and watch the traffic drive by. If you watch long enough you can also see the hawk come back to the nest with lunch a.k.a. pigeons.